<< Back 1965 Photo of Lorenzo Bandini - Ferrari 512 - Grand Prix Italy - Monza - HUGE ! 1965 Photo of Lorenzo Bandini - Ferrari 512 - Grand Prix Italy - Monza - HUGE ! 1965 Photo of Lorenzo Bandini - Grand Prix Italy - Monza - HUGE ! 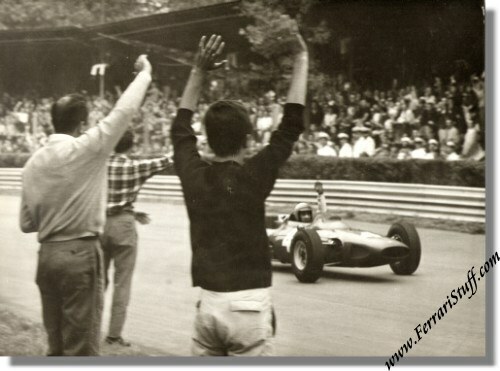 This is a HUGE vintage 1965 photo of Lorenzo Bandini in his Ferrari 512 being cheered on by the marshals after achieving 4th place (& highest place Italian driver AND highest place Ferrari driver!). This is a very large format photo (actually too big to fit onto our scanner) which measures some 30 x 24 cm or 12 x 9.5 inches. It is in excellent condition bar a small fold in the left bottom corner which will be virtually invisible once properly framed and matted. It carries the photographer's stamp on the back.